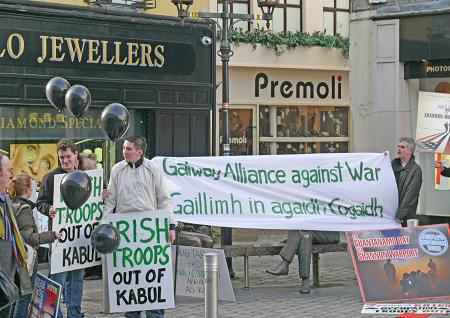 The Galway Alliance Against War marked the 7th anniversary of the invasion of Afghanistan yesterday, Thursday 20th November and called on the Irish government to withdraw Irish troops from this occupied country. Ireland’s involvement in this conflict does not stop at Shannon airport. Irish officers are presently working alongside NATO forces in Kabul and some of those soldiers are known to come from Galway’s Liam Mellows barracks. Irish officers with experience of Improvised Explosive Devices (IEDs) from their time in Lebanon are involved in assisting NATO. Specifically their task is to try and prove a link between these Taliban weapons and Hizbullah and Iran, so as to give the US a “reason” to bomb Tehran. Tom Clonan writing in the Irish Times in October had a more benign take on Irish involvement in Afghanistan, but he also stated that a senior Irish officer is currently deployed in “counter-propaganda operations” there - an equally sinister development and one that Mr Clonan did not elaborate on. 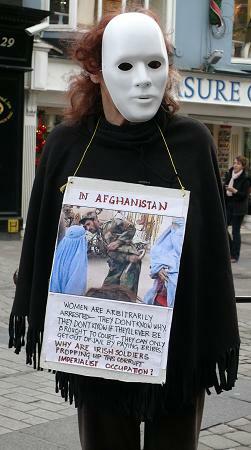 One wonders was Irish involvement in this illegal occupation of Afghanistan ever discussed in the Dail? GAAW came into existence to oppose this specific war. A war waged by the most powerful country in the world against one of the poorest and underdeveloped. In the past 29 years, Afghanistan has been a victim of the superpowers - first, the senseless and brutal Soviet invasion in December 1979 and then the US invasion in 2001. The war waged by Washington will fail just like Moscow’s adventure. But it is the Afghani people who will suffer most. It is not war the Afghans need but help - a third of the children suffer malnutrition, life expectancy is only 44 years and the country is one of the most underdeveloped lands in the world. 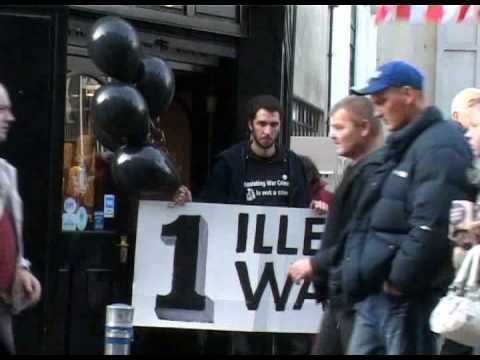 It is also 7 years this month that Galway Alliance Against War was formed. Our peace group has developed sound ties with the Irish Anti-War Movement over the years and has raised funds in solidarity with Mary Kelly, the Pitstop Ploughshares and the Raytheon 9 as well as contributing to a project in Lebanon brought to our attention by Caoimhe Butterly. But during those 7 long years, GAAW has been waging its own struggle in Galway against the militaristic Salthill War Show. That campaign won us a lot of friends, but also a lot of enemies. Amongst the latter were the usual suspects, the rightwing politicians and the local gombeens. 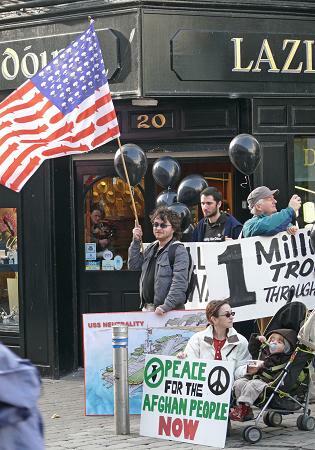 The Gardaí, of course, were on hand in 2006 with their pins to try and scupper our 99 Red Balloon Peace Event – in fact their intervention had the direct opposite effect, garnering our campaign even more support. 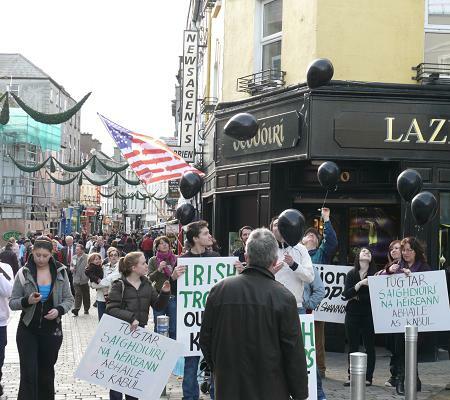 In 2007, the Gardaí had a low profile, even though they banned our balloon event. But at one of GAAW’s peace vigils a senior Garda assaulted one of our members. But that is par for the course, as are attacks from former ultra-leftists: A former member of Militant by the name of Kevin Higgins decided to attack members of GAAW in a “poem” entitled “The Annual Salthill Air Show Protest”. As the title of Mr Higgins’ poem suggests he never believed GAAW could win its campaign against that obscenity. Alas, he was wrong! Last summer there was no War Show and only in the last week it has been confirmed there won’t be another ever again! Anniversaries are an appropriate time to raise issues: earlier this year we held a vigil on the 6th anniversary of the Iraq war and last January GAAW had intended to have Liam Mellows don an orange suit in solidarity with those incarcerated in Guantanamo – a camp that was opened in January 2002. The local gombeens were aghast at this idea, but so too were the silly zealots of RSF. Without doubt if it had been a green suit the latter wouldn’t have been so outraged. However, the issue of Guantanamo and Ireland’s role in supporting “extraordinary rendition” was given a good airing in the local media. So yesterday’s marking of the Afghan war was also used by GAAW to mark the 7th anniversary of our peace campaigning, but we don’t view it as a happy occasion. However, there were balloons, black ones. This report drips with sectarianism. A former member of Militant, the predeccessor of the Socialist Party, is referred to as "a former ultra-leftist" in what purports to be an official report/statement on behalf of GAAW about their Afghanistan protest. If one is to follow the logic of Galway Alliance Against War are Joe Higgins and Clare Daly current and still practicing "ultra-leftist[s]"? America was attacked by Islamic terrorists on 9/11and the vicious Taliban extremist government were their guardians who gave them a safe haven in Afghanistan. The Taliban and Al-Qaeda want to set up a global Islamic Caliphate. If you are a socialist, an internationalist, a supporter of freedom and democracy and human rights you should support the NATO action in Afghanistan. The primitive barbaric ideology of the Taliban and Al-Qaeda is the anti-thesis of everything that the Left stands for. The new left wing African American President of the USA , Barack Obama supports this war and that is good enough for me. 2 min 40 sec video GAAW peace vigil in Galway. 7th anniversary of war in Afghanistan. As a former United Nations peacekeeper, I fully support the GAAW call for the withdrawal of Irish troops from Afghanistan. These soldiers are part of a NATO force that is trying to impose a corrupt regime on the people of Afghanistan, against the wishes of the vast majority of the Afghan people. The Irish Government will try to argue that these soldiers are explosives specialists simply giving advice to NATO staff. Since explosive devices are one of the most effective weapons that the Afghan insurgents have against the occupiers of their country, then any military assistance given to their enemies constitutes a breach of Irish neutrality and participation in a war in which NATO and the US are trying to prevent the people of Afghanistan from achieving self-determination and freedom. This Afghan war is very similar to the war waged against the Afghan people by the Soviet Union in the 1980s and it will have the same inevitable result, with very similar drastic costs in human life and suffering for the people of Afghanistan. It also has similarities to the war of independence waged by Irish insurgents against the British empire. The arguments put forward by Tony Blair in 2001 and by others in the meantime that it is necessary to prevent the Taliban from ruling Afghanistan because of the flow of drugs from Afghanistan, is a lie. The United Nations drug control agency issued several reports confirming that the Taliban government has virtually eliminated drug production in Afghanistan during the years immediatly prior to 2001. The US and the UK made deals with the drug producing warlords in 2001, in which briefcase loads of US dollars were distributed to these drug barons in order to get there support for this unlawful and unjustified war. I also call, and urge the GAAW to call for a withdrawal of Irish troops from Chad, which is a so-called EU peace mission. However, this Chad EUFOR mission is a thinly disguised neo-colonial mission to prop up French client dictator General Idris Debe. Irish troops should be serving overseas only with fully justified United Nations missions, under United Nations command and control. The argument that the UN is inadequate to maintain international peace must be countered with the assertion that Ireland and other UN member states have a duty to reform the UN to ensure that it has the necessary powers and support of international law to enable it to be genuine keeper of international peace, and not a perpetrator of war. UN support for the wars in Iraq and Afghanistan means that the UN is in breach of its own Charter. You surely can not be serious. Is the fact that so many innocent people are murdered mean nothing to you. you moan about the wars which are going on all over the world but what about the war in this country, you have been killing each other for years, but i guess thats ok??? The red arrows are a display team and the planes are not used in war, the pilots may have been depolyed to war areas. The letting off ballons is an idea but what happens if one of those ballons gets stuck in the engines, what would happen then??? I guess you would say its not are fault. 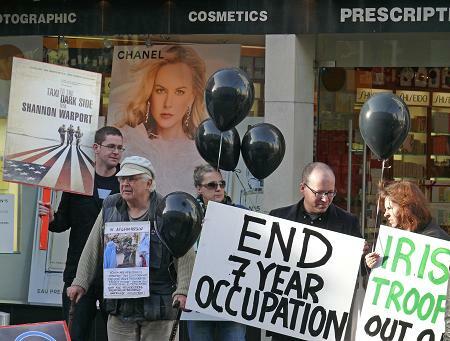 6 anti-war arrested at Northwood on anniversary of NATO bombing of a wedding party in Afghanistan. Those arrested included author Milan Rai, Trident Ploughshares founder Angie Zelter and two members of the London Catholic Worker. “NATO and the US are trying to prevent the people of Afghanistan from achieving self-determination and freedom”. SURE they are...my innocent friend. Oh yes...The Taliban are “Mom and Apple Pie” . You're really going to have to get off the net to get an education. Try reading a book....try this one by "Pakistan's best and bravest reporter (pro-war Christopher Hitchens)" Ahmed Rashid "Decent into Chaos - How the war against Islamic extremism is being lost in Afghanistan, Pakistan and Central Asia"
Rashid is no radical, author of the bestselling "Taliban" he is well researched and sourced. If a book is too time consuming in these daze. Try this interview as an intro...could be a taster. The Taliban were invented by Sauds, U.S. and Pakistan, go figure!